"Windows Photo Viewer can't open this picture because the file appears to be damaged, corrupted, or is too large." 27 out of 96 shots were affected. I shot with three different lenses and images from two of them were affected. Three different focal lengths with my Nikon AF-S VR 70-300mm f/4.5-5.6G IF-ED and also with my Tamron SP 90mm F/2.8 Di Macro 272EN. No shots taken with my Nikon 50mm f/1.4D were affected, but the problem had stopped occurring with the Tamron by the time I started using that lens. I used a card reader to copy the files to my computer via a USB-2 port (my computer is older than USB-3). When I noticed the problem, I put the card back in the reader to see if the files on the card were corrupt and they are. I didn't expect anything different if I left the card in the camera and used the cable to review the files in Windows Explorer, but I do see thumbnails for the NEF files this way. Also, when I check properties/details I do see a pixel count. I noticed on the thumbnails for both the JPG and NEF files that there is a wider black band at the top and bottom of photos with the problem. In addition, the pixel count of the unaffected NEF files are 6000 x 4000 as expected and 6000 x 3368 for the affected files. I haven't checked them all. I copied the files from the card via the cable to a different directory and the NEF files are again unreadable. I kind of expected that. I haven't tried with Lightroom yet. Another curiosity, The affected photos actually span 28 shots. The problem went away for one shot. Weird. So, if I can't find a program to accept these raw files I guess I am stuck with the JPGs. Paranoia occasionally pays off. These weren't photos of anything special, but I am concerned about my camera. I had the second card set up as overflow since I'm just shooting for fun, but I suppose the next thing to do is to set it up to duplicate. I'm unlikely to fill one 32 GB card let alone two. But, I really would like to see if anyone has seen this issue or if anyone has an idea of what has happened. I guess I have ruled out the card reader and cable. It could be the card or camera I suppose. I have removed the card from the camera a few times and I didn't format each time. Or maybe it was just the phase of the moon? Was Jupiter aligned with Mars? 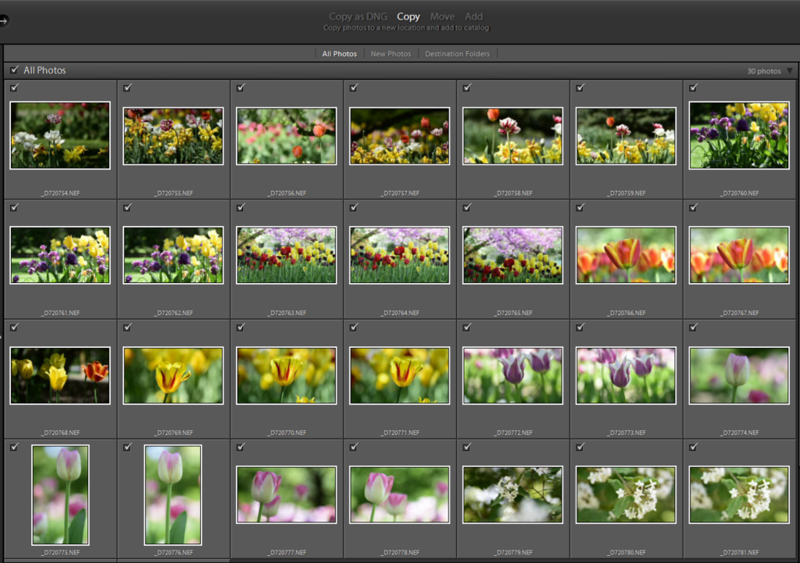 I went ahead and tried Lightroom with the files I copied directly from the camera and the NEF files are visible. So are the ones I copied via the card reader. Here's a screen shot that shows the smaller images for the affected files. I copied one "good" file before and after the affected range. This also shows the one "good" file among the "bad", top row far right. The snip doesn't include all the files so the one "good" file at the end isn't shown. I'm still confused, but it looks as if I can edit. Do you have another computer and card reader you can try? Maybe a local photographer friend you can trust. Be sure to set the write protection on the card first, of course. Thanks for the quick response Ziggy. I tried with a different card reader on my laptop computer and got the same results. 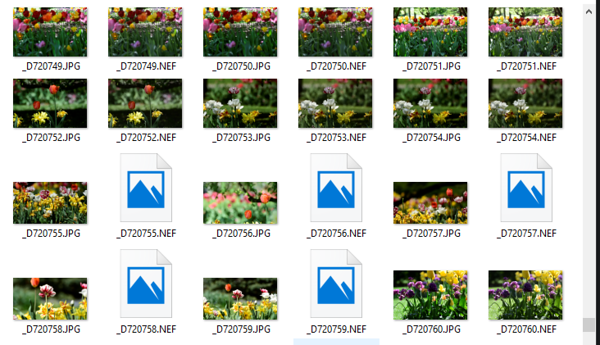 I didn't actually copy the photos, but I am looking at the card contents with Windows Explorer and the 27 JPGs have dimensions of 6000x3368 and there is no thumbnail of the NEF files. Other NEF files show a thumbnail. I think the files are really smaller for some reason. Since I am seeing the effect with two card readers, two computers, using the Nikon supplied cable, and in the downloaded NEF files in Lightroom, I have to conclude that something is off with the files. When I review the images in the camera LCD, I also see the smaller dimension. I'm not sure about NEF definitions so I don't know if that would be enough to make them unrecognizable to Windows programs. Lightroom doesn't seem to have a problem. If it was just with one lens I might have thought that was the problem. I tried an online search to see if others have reported something similar and I came up with nothing. I'll work on the search terms and continue looking. Would it be worth contacting Nikon customer service to see if this is something they know about? This sounds like it could be a firmware issue. Please do check to make sure that you have "C" firmware version "1.03" installed. Check the third bullet. I was using live view for some of the shots. Maybe the one that wasn't affected was one where I didn't use live view. I will experiment and if I can duplicate the effect on demand I will feel better. Seems like the camera may be doing exactly what it is supposed to do, and I wasn't. Don't we have an embarrassed emoji anymore? I will also check the firmware. Thanks Ziggy. The camera is pretty new, but I was reading Lillian's thread and the comment there about new cameras not necessarily being updated applies to me also. Thanks. I might as well fix all the operator errors. I have C 1.02 installed. I guess it's time for an update. OK, definitely operator error. 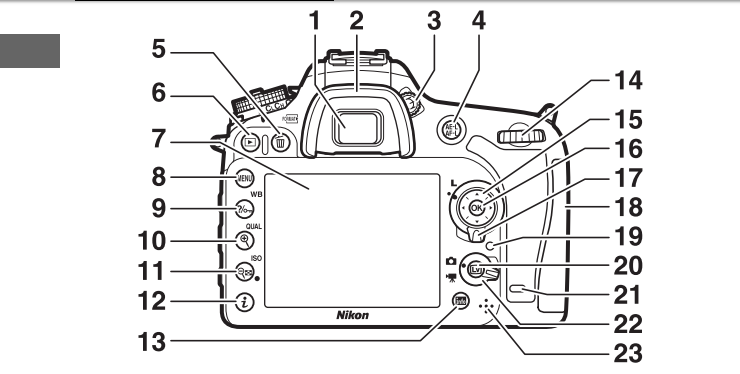 Here's a diagram of the back of the camera from the user's manual. The culprit is item 22, the Live View selector. In the diagram the dot is pointed to the camera, indicating still photography. My guess is that the dot was pointed to the movie camera when I started shooting and stayed there when I switched to Live View. I apparently took several LV photos and switched back to direct view for one (the good one in the middle of the smaller photos). At some point I must have noticed the switch was on movie instead of photo and changed it back. I don't actually remember doing this but evidence would indicate that happened. I knew that in menu mode that switch changed from movie to photo menus but I didn't know about the LV change since I don't do much LV or video. But, on this day I was using the tripod and trying to get flower photos with out of focus flowers in the background. Live View was helpful and the switch setting did what it was supposed to do. The side effect was that it confused the heck out of me. Thank you Ziggy and Denise for taking the time to respond and I apologize for wasting your time. Not a waste at all. Your identification of the problem could help everyone who experiences the same thing. Trust me, this can happen so easily in a camera case, a switch moving out of position. It has happened to me too, just not this particular problem. Thanks for posting your identification of the problem, which is really a design issue too! Now we are all better informed and can look out for it happening on our cameras, and know exactly what to do when it happens. Very true. I guess the camera is just similar enough to my D90 that I was feeling overconfident with the controls. This switch is not present on the D90 and I had already identified one function for it on the D7200. As far as the design issue is concerned, with so many features and so little space available many of the switches will have to perform different functions when in different modes. Since I don't use Live View very much I had skipped that part of the manual and when I needed it I just tried to use my D90 knowledge. One little difference... Still, it's a learning experience. At least I can still use the photos. Thanks again. I really do appreciate the way you are willing to share your knowledge and experience.